(Nanowerk News) A tiny new sensor could provide fresh, inexpensive diagnosis and treatment methods for people suffering from a variety of diseases. 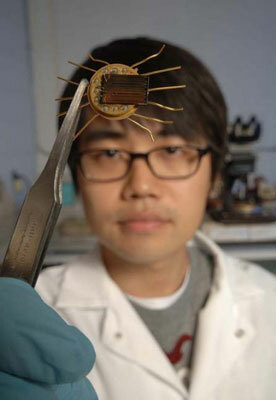 University of Florida chemical engineering graduate student Byung Hwan Chu displays a new sensor that could enable diabetics to measure glucose levels in their breath, replacing the finger prick method in wide use today. UF engineers have used other versions of the sensor to detect chemical indicators of cancer in saliva. Several companies have expressed interest in pursuing the technology for medical applications, said UF chemistry professor Fan Ren.